Is there anything creepier than an abandoned asylum? 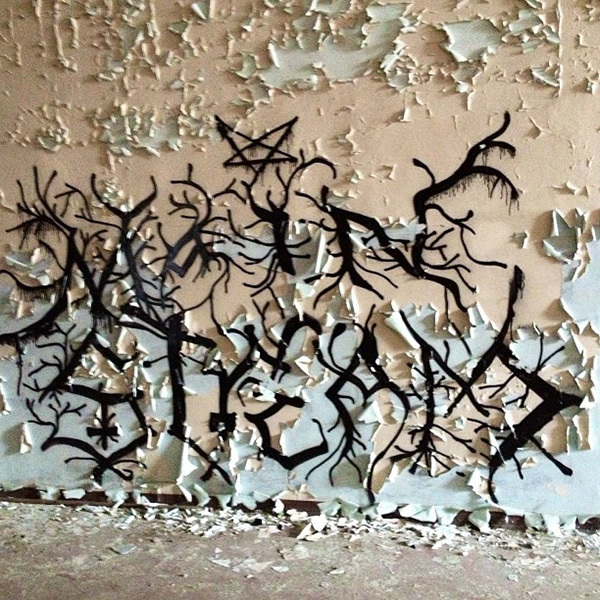 How about an abandoned asylum filled with paintings like this? 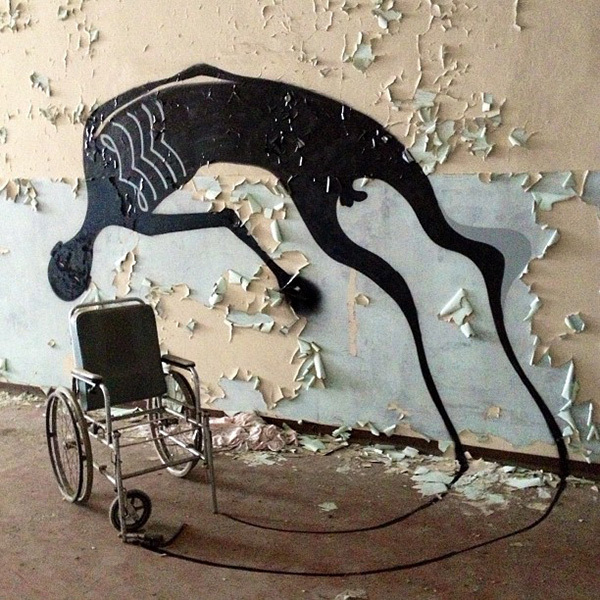 Brazilian street artist Herbert Baglione let his imaginative talents run wild in a psychiatric hospital in Parma, Italy–turning the already creepy and disturbing into the stuff of nightmares. 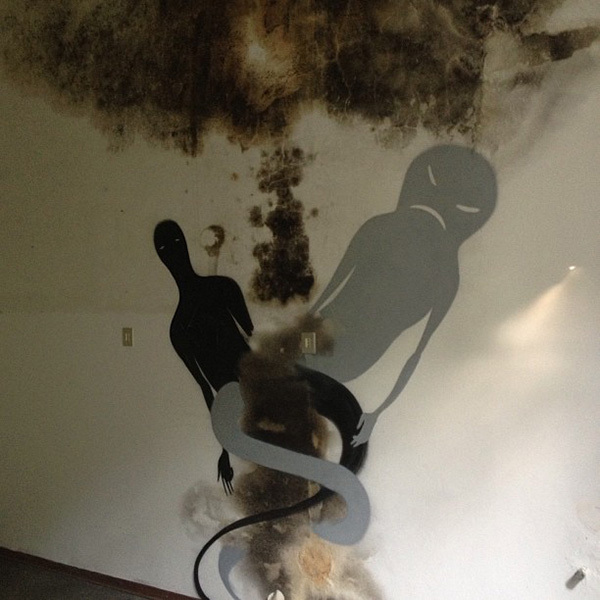 The unsettling murals are part of Baglione’s 1000 Shadows project. This is a man willing to really suffer for his art–Baglione has been known to paint with his own blood. Could you spend a night here? What’s the creepiest abandoned building you’ve ever seen? All photos courtesy of the artist, Herbert Baglione. Can’t get enough creepy stuff? Sign up for my newsletter. As a thank you, you’ll receive Lost, my dark mystery, absolutely free. Paint with his own blood? That is disturbing. He is a most unusual guy, Alex, that’s for sure! Oh, that is deliciously creepy. Yes, I’d spend a night in a haunted location. You would? Brave woman! I may have to take you up on that. Why don’t I find a haunted cabin for our next writers’ retreat? OMG, that’s amazing. I love it! 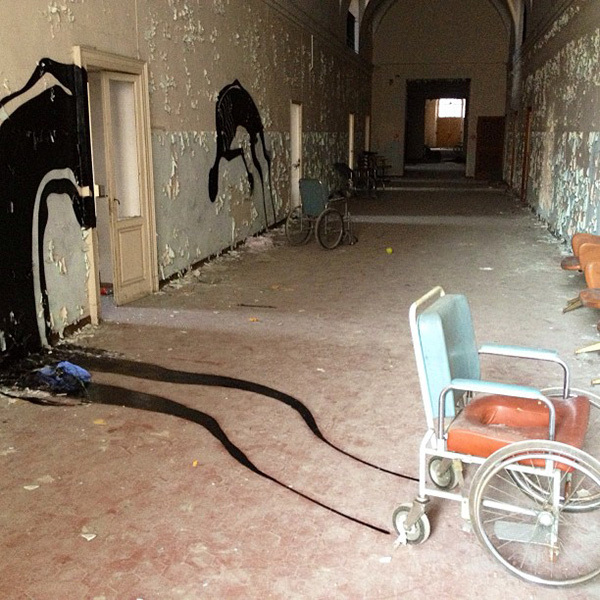 Yes, abandoned asylums are creepy. I’ve always wanted to go to the one in Louisville, Kentucky but they only do tours one or two nights a week during certain times of the year and I never seem to be able to get there that time of the year. Unfortunately, it was torn down a few years ago. It was quite the creepy-looking building! Too bad it was torn down. Danvers is actually really close to our residency address in Massachusetts and when I read your first sentence, I wanted to go for a visit! Yeah… Definitely a no to spending the night there. Eek. I don’t imagine it smells too good in there, either. Painted shadows “cast” from real wheel chairs? Clever! Those paintings make the asylum even creepier. And he wanted with his own blood? I don’t want to know what he did to get enough of his blood to paint with. I don’t think these were painted with his own blood, but some of his other 1000 Shadows projects were. I agree that it makes the asylum quite spooky! As if it wasn’t creepy enough on its own. Has Stephen King discovered this place? I’m enthralled and scared out of my wits by what this artist has created. Those are very cool. Creepiest place I went to was an abandoned building in my hometown the guy I was dating and his friends dragged me along while breaking into. I’m very glad I wasn’t watching ghost shows at the time because I would have scared myself even more. Abandoned buildings are very creepy, haunted or not. I’ve gone on photo safaris in some of them. You can get some awesome photos. These photos are AMAZING!!!! Holy crap! I’ve actually scrolled through them a couple of times now. I’d actually spend the night there just to see how the paintings change with the sun going down. Super creepy! Thanks, Clarabelle, and thanks for all the follows and support! You are all kinds of awesome. Back in high school a few of us got in the habit of finding abandoned places to sneak into at night just to creep us out and give us a sense of adventure. There was an old two-story house in Beaumont, TX that we went in several times. It had to have been grand at one time. But the only furnishings in the place were dozens of wheel chairs!!! In that respect similar to the place in your post! Now that would make a good series of YA books, Barbara! I imagine you must have had some crazy adventures. A grand old house with wheelchairs would remind me of The Changeling–have you ever seen it? Brr! Welcome to my blog! Hope to see you back here. Those paintings are wonderfully creepy. Somehow, I actually think they help make the asylum less eerie. I mean, we’re all probably thinking stuff like that anyway–it’s like acknowledging the monster under the bed, taking away some of its scariness. Really cool post, and happy A to Z! Hmm…interesting point, Sara. It’s like turning it into an art exhibit rather than a depressing monument to sickness and death. Thanks for the kind words! We’re almost halfway home. Have really been enjoying this series. Strangely, many of your topics have coincided with events happening in my life. After reading your post about ghosts, Ina asked me to share one of my most recent paranormal experiences. I was reluctant at first, but I finally told her about my trip to the haunted sanatorium I’d visited on Easter Sunday last week. I live just 7 miles from the abandoned hospital, and never knew it existed until just recently when some students mentioned it in class. They told me it was built in the early 1900s and was used to treat patients suffering from TB and leprosy. They also told me it’s one of Spain’s most haunted places. So, I talked my husband and stepson into a little excursion. It was all meant to be fun, but strange things followed… Of course I found a rational explanation for what happened to us while we were there. For instance, the dizziness and sickness my husband and I both experienced inside was because of the slanted floors; and my stepson feeling scared when something brushed by him was just the wind (even though there was not so much as a breeze that day). Still, I’ll always look for a rational explanation. But the weird thing that occurred was how I felt a strong presence of children inside. I even felt like children wanted to play with me and maybe come home with me. As a writer, I have a very active imagination! That night, I couldn’t sleep and finally got out of bed at about 3 am and started writing. Within 20 minutes, I finished a poem about various children inside the hospital and what happened to them. I wanted to know the exact date the hospital opened to include in my poem, so the next afternoon I googled the hospital and was surprised to read that after the sanatorium closed, it was reopened in 1962 as an orphanage for abandoned children. I had absolutely no idea it was used as an orphanage. I can say that visiting that site certainly has led to some interesting writing. Look forward to how Transylvania will inspire us! Wow, that sounds fascinating, Tausha! I would love to go to a place like that. You’re “lucky” to have one in your own backyard. Your buildings are so much older than ours too…you have a history North Americans can’t replicate. I’m very much looking forward to our trip and being inspired. I can’t wait! It’ll be great to meet you. Any darkened hospital, even a running hospital with the lights turned down at night, creeps me out. Yeah, they aren’t fun places. I don’t care for them, either. Fascinating post with very powerful images – I’ve never been anywhere that creepy! This is the creepiest abandoned building I have ever seen. 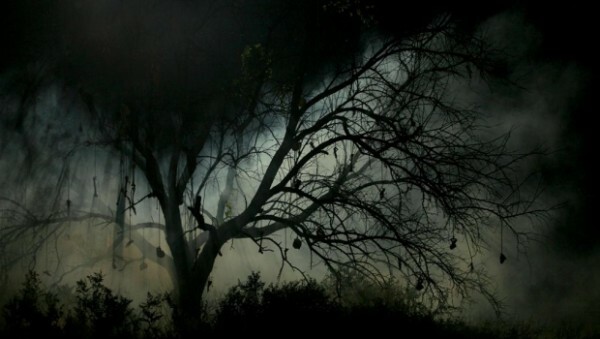 I would NOT want to spend the night here! At the same time, there are so many stories/plot ideas jumping at me just from looking at these images. Another great post – I really do love reading these. Unique and spooky! Thanks so much, Crystal! I’m glad you’re enjoying these posts. I can only imagine what it must smell like in there. I would definitely love to visit and take some pictures, but stay overnight? Nah…. Now THAT’S a compliment. Thanks, Madeline! Yeah-no. I don’t do creepy buildings. Especially creepy buildings with creepy art! I love abandoned buildings. I can’t decide if the drawings make this place more or less creepy. Visually, they’re creepy, but then I think if there was anything bad enough to scare me there, the artist probably wouldn’t have lasted long enough to complete them. No way! I get nightmares just thinking about that stuff. It is intriguing, though. Our family visited the State hospital for the mentally ill a few years ago. My great grandma was sent there after suffering postpartum psychosis. She died there and is buried in a field near the hospital. It had a dark vibe and I felt it the moment we walked up the stone steps. That is really creepy. No way would I spend a night there or in any abandoned asylum. Fantastic pictures. Maybe this artist escaped from this asylum?? Just saying but I have to say I do like his paintings and his impression because, to be honest, I felt like it was positive as the spirits are out of their chairs and are flying free. I don’t think I would stay there overnight unless others were with me and I don’t mean the ghostly kind. Creepy, abandoned buildings are my favorite. The desire to explore is always really, really strong although I usually resist because I don’t want to get shot by an overeager property owner. =/ The creepiest are probably in Fairhaven, Ohio which I’m a tad obsessed with. The whole, tiny town gives off a super creepy vibe for me (no offense to anyone that lives there) and I can’t even pinpoint why. But I get goosebumps and the hair on the back of my neck stands up every time we go through there. It seems like a ghost town at times, although I know people live there. But you rarely see any people when you drive through and there are plenty of abandoned homes and old buildings.